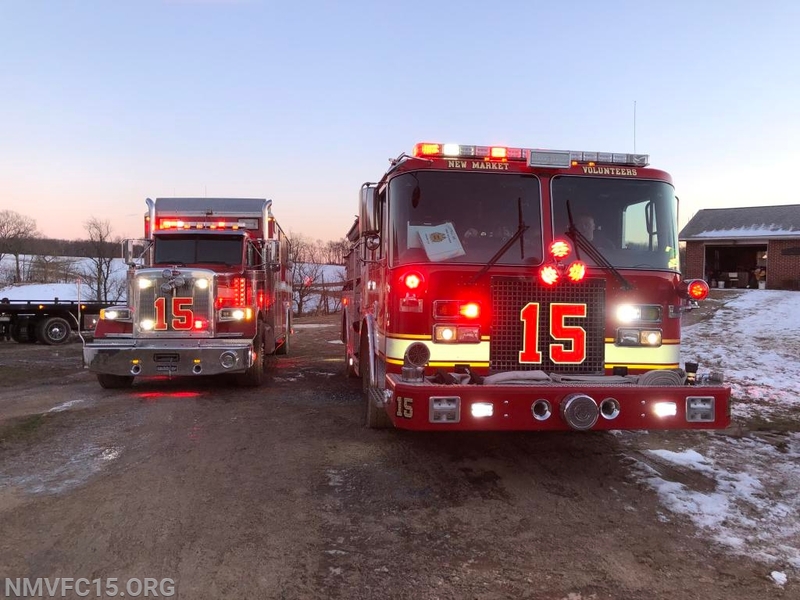 On Sunday, January 20th at 1421 hours, Box 17-28 was alerted for the house fire in the 12500 block of Old Annapolis Road. E152 (Sgt. Kennedy), RS15 (AFC Bowles), A159 (Capt. Cribb), U15 (LT Jones), and C15 (FC Nalborczyk) responded on the box with 20 volunteers. Chief 15 arrived to find a single family home with smoke in the basement and a possible basement fire. E152 arrived and assumed the first due engine responsibilities, laying a supply line about halfway down the 2000 foot long driveway. E172 completed that split lay, with E251 functioning as the supply pumper. E152's crew stretched a line to the basement and found a working fire with possible extension into the walls. Command reported smoke showing from the roof and first floor and requested the RID and tanker task force. E152 made a quick knock on the basement fire, while RS15 split their crew and performed searches and opened up the walls to check for extension. Units knocked the fire with 30 minutes and command held the first alarm and RID units. Co. 15 units remained on scene for over three hours to assist the fire marshal's investigation. Chief 15 held the Old Annapolis Road command.